Our bronze door handles are offered in a variety of hot and cold patinas but the most popular c are our light and dark antique patinas. 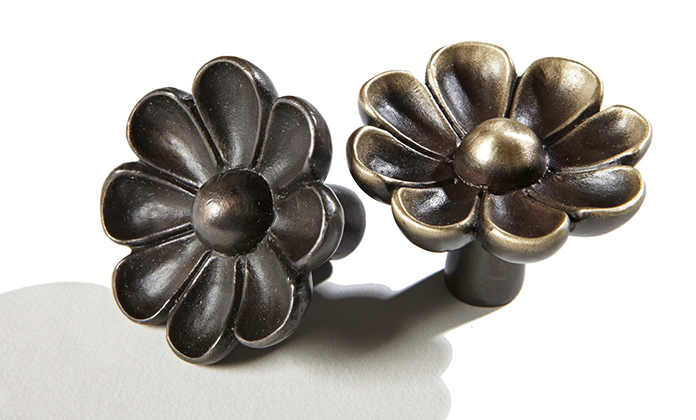 I hope to explain how we create these 2 patinas step by step using our daisy cabinet pull to demonstrate the process. Over time bronze will develop its unique patina and its surface color can range from brown to black to blue or green as it reacts to the chemical properties in the local atmosphere and as the surface of the bronze begins to oxidize. With our antique finishes we try to emulate the brown and black surface tones to create a controlled aged appearance. To do so we use a product made by Birchwood Technologies called M20 Antique Black. Their solution, unlike pigmented stains, does not sit on the surface of the metal but rather through chemical conversion it creates a 3 to 4 micron thick patina. However, before this process happens the bronze handle must be cleaned. Our castings are first placed in a sealed and pressurized chamber and glass beads made from fine silica are air- sprayed into the chamber to remove small casting burrs or rough particles. We then remove even smaller burrs or scratches with a buffing wheel and disks, progressing as needed, from medium grit to fine grit disks. The disks we use are made by Standard Abrasives and made from a tough resin reinforced nylon fiber with aluminum oxide which acts as an abrasive element. Since the nylon web is un-woven it is more flexible and so will follow the contours of the bronze. Using M20 we make our own solution using 1 part M20 and 1 part distilled water mixed in a non-reactive dipping vessel. The piece is immersed for 30 to 60 seconds and then neutralized by immersion into another vessel of distilled water. If,upon inspection, we see that certain areas have not reacted to the solution and are still bright we re-clean those areas and dip again. As you can see from the # 3 above the chemical conversion creates a fairly uniform patina which is somewhat drab. To create greater contrast we gently and strategically burnish by hand areas with a fine nylon abrasive pad and thereby re-expose the golden tones of the bronze casting. To seal the bronze we use a soft cloth to apply 2 coats of oil and once dry, finish with hard wax. There are many products to choose from but we have found Sculpt Nouveau’s metal oil and black wax easy to work with see useful links below.